Animals making tools...what else are they capable of? Animals are at it again. Acting human. Or rather, exhibiting behaviors that we once thought were exclusively human. We once believed, I might say, that these behaviors defined humans as better, different, smarter than all other living things. I'm talking about tool use. As it turns out, tool use has now been observed in dozens of nonhuman species, including otters, monkeys, chimps, and 39 species of birds! 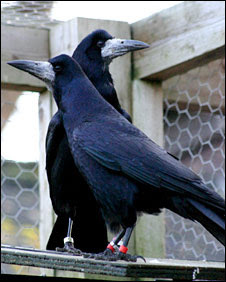 The most recent study involves rooks, a crow-like European species common in folklore. They're in the same family as our American crows, ravens, jays, and magpies. The rooks in this study, reported just today (May 28) in the Proceedings of the National Academy of Sciences, were given access to food that could only be obtained by pushing a small rock off of a ledge into a tube. They quickly mastered that task. Christopher Bird of the University of Cambridge and Nathan Emery of Queen Mary College, London, challenged the birds further by moving the small rock farther away. Before long, a female rook, Fry, figured out picking up the stone and carrying it to the ledge. Her mate, Cook, followed her actions, then a second pair did. The birds mastered various other tasks involving tools such as sticks and wires. They even figured out how to bend a wire to fashion a hook necessary to retrieve items. Although wild New Caledonian crows have been observed fashioning hooks in the past, the authors assert that this is the "first unambiguous evidence of animal insight, because the rooks made a hook tool on their first trial we know that they had no previous experience of making hook tools from wire because the birds were all hand-raised." The New Caledonian crows were known to use tools in the wild. I love research that shows how smart animals are, and how we're not the supreme beings we think we are. What else are animals capable of that we don't know about yet? They deserve more respect, more of the world's remaining resources, than they're getting from their human relatives. My previous post about New Caladonian crows making tools. All my previous posts about tool use (or making tools) in animals. Christopher D. Bird and Nathan J. Emery. Insightful problem solving and creative tool modification by captive nontool-using rooks. May 28, 2009. Proceedings of the National Academy of Sciences. On a recent trip to the South Carolina coast with my friends, we stopped at Bargain Beachwear on Highway 17 to look for clothes. Among the thousands of objects for sale were many unfortunate animals – dead and alive. Alligator specialties abounded, right up front were the dried alligator heads. Also popular were alligator feet or hands attached to a wooden pole, so you could hold the pole and pretend to “claw” your friends. Beyond the alligators was a wire cage full of hermit crabs, all of their shells dyed neon green, pink, or yellow. The floor of the cage was a wire mesh with holes much too big for the crabs, and they were all stuck in the gaps. A woman who worked there told me she was the only employee not too squeamish to clean the cage. I turned away from that unfortunate scene to wander over to the live frogs for sale in tiny containers; they looked like African Clawed Frogs. The containers held about one cup of water and were advertised as requiring almost no cleaning or maintenance. Wonder how long those frogs might live in one cup of untended water? Scattered around the store were about 200 fake cats. They were designed so as to lie on the floor of your house so you could pretend that you have a real sleeping kitty. Upon closer inspection, I discovered that the cat fur was really rabbit fur. Who knows how many rabbits were killed for these totally superfluous items. Everywhere I turned something new appeared. There were the dried puffer fish, blown up to their full capacity and solidified with an invisible goo. The fish had fake eyes glued over their original sockets and sold for about a dollar, designed to dangle from the ceiling as a decoration. 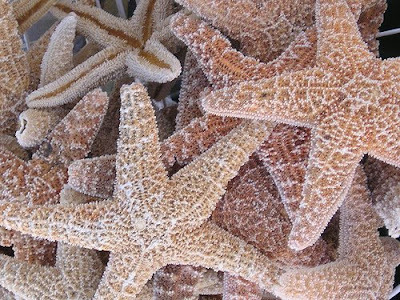 All around were an abundance of shells, dried starfish, seahorses and other dead sea life offered for sale as souvenirs or gifts. Each was engraved with some posh Myrtle Beach design as a remembrance of the trip. I can't guess how many of these animals are being harvested every day. Bargain Beachwear is only one of probably thousands of beach outlets along the east coast selling animal parts for next to nothing. A dollar for a dried puffer fish. What started the demand for such things? Is it the sick satisfaction of holding what once was wild? Is it our admiration of beauty? Whatever the case, deep down we don't need them like this. 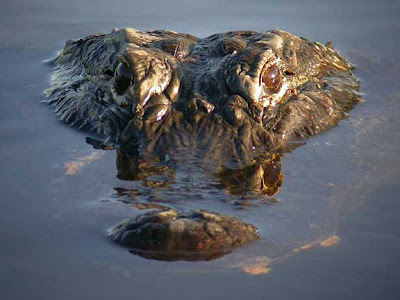 Watch them alive in the wild, or on your HDTV. But there's no need to have it for yourself. Hang up a photograph of it instead. When you buy souvenirs to take home from your trip, don't buy anything that has animal parts or plant parts in it. How do you know it isn't a species that's declining from overharvesting? You don't. So don't buy it. For more information on this topic, go to World Wildlife Fund's Buyer Beware page for travelers. Dairy cows' rear-ends: bad news for our climate. "Local" is the mantra in sustainable food these days. But should it be? Is eating locally-produced food the most powerful thing we can do to reduce our ecological "foodprint?" A new study from Worldwatch Institute says no indeed. I love Worldwatch. They crank out study after study with lots of hard data, evaluating the environmental impact of various consumer choices. So useful! So fun to quote! Don't get me wrong - I'm all in favor of local food. We definitely should support small-scale farmers in our own communities who are growing food organically and sustainably. For years now, I've been writing and speaking in support of them, on this blog and in our books and at various conferences. There's no question that, all other things being equal, buying food grown nearby is better than buying food that's been trucked for long distances. Less transported food means fewer emissions and a smaller carbon footprint. But as Sarah DeWeerdt points out in this new Worldwatch article, we need to look at the whole production picture - not just how far food was transported from producer to market. As it turns out, when we look at life-cycle analysis, a "cradle-to-grave perspective" on food products, food miles are "a relatively small slice of the greenhouse-gas pie," says DeWeerdt. In fact, according to a comprehensive analysis last year by Christopher Weber and H. Scott Matthews of Carnegie Mellon University, final delivery from the producer or processor to the retailer accounts for only 4% of the U.S. food system's greenhouse-gas emissions! Materials required for cultivation and processing must be transported too; this transport is considered part of the "upstream" miles and emissions. Such materials include fertilizer, pesticides, animal feed, etc. But the transport of these items, together with transport to market, still accounts for only 11% of the food system's emissions. What's the source of all the other greenhouse gases associated with agriculture? Production. Primarily, production of livestock. Weber and Matthews from Carnegie Mellon found that a whopping 83% of food-related emissions occur before the food leaves the farm. Tara Garnett, in a recent analysis of a U.K. food system reached similar conclusions. Numerous studies reviewed by DeWeerdt have found that livestock production generates a much higher volume of greenhouse gases than does plant production. Beef and dairy cattle are the worst culprits; DeWeerdt calls them "agriculture's overwhelming 'hotspots' " in terms of greenhouse-gas emissions. A group of Swedish researchers has calculated that meat and dairy account for 58% of that country's total food emissions. In Garnett's study, meat and dairy accounted for half of the U.K. food system's greenhouse gases. 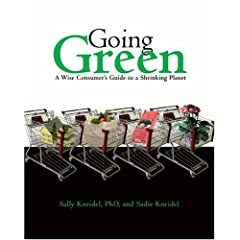 Garnett writes, "Broadly speaking, eating fewer meat and dairy products and consuming more plant foods in their place is probably the single most helpful behavioral shift one can make" to reduce food-related greenhouse gases. Weber and Matthews reached a similar conclusion: "No matter how it is measured, on average red meat is more GHG-intensive than all other forms of food. " The dairy industry, in their study, was the second-biggest contributor to greenhouse-gas emissions. A large proportion of emissions associated with beef cattle and dairy cows are the greenhouse gases methane and nitrous oxide. Methane is 23 times more potent at trapping solar heat than is carbon dioxide; nitrous oxide is 296 times more potent (molecule per molecule). Methane comes from the rear-ends of ruminants such as cows. Both methane and nitrous oxide come from manure, especially the vast, open "waste lagoons" associated with factory farms. Well then, just how much does food contribute to the planet's overall carbon footprint? I reported on that in a previous post. In 2006, the United Nations Food and Agriculture Organization published a live-wire of a paper entitled "Livestock's Long Shadow." According to that research document, livestock account for 18 percent of all greenhouse gas emissions. And here's the kicker - that's more than all forms of transportation combined! You can easily google that document for yourself. Just read the 3-page Executive Summary in Part I, which summarizes the the whole 400 page report. After concluding that red meat and dairy are emissions hot-spots, DeWeerdt does go on to review the merits of buying local food. One clear advantage, which Sadie and I talk about in our presentations, is that local food is in general grown by small-scale farmers who are openly accountable for their treatment of the environment and their livestock. The farmers I know who sell food to their own communities welcome visitors to inspect their methods. This is a far cry from industrial producers who keep their exploitive and often abusive operations shielded from public view. So buy local. But, if you want to contribute to a liveable planet for your grandchildren, eat low on the food chain too. And join me in a tip of the hat to Worldwatch for another fine study. Sarah DeWeerdt. Is Local Food Better? Worldwatch Institute. Accessed May 15, 2009. Livestock's Long Shadow. United Nations Food and Agriculture Organization. Rome, 2006. Why is swine flu likely to return in winter? It's NOT because folks are cooped up together in winter. Swine flu is so far turning out to be a milder disease than was feared a couple of weeks ago. Although it continues to spread from person to person around the globe, in most places it has been no more lethal than more familiar and common flu strains. That could very well change though when autumn rolls around. "Our evidence from all previous pandemics is you get two phases. So you get a first wave which is often very mild and then you get a much more serious wave that comes along in the autumn and the winter," said Alan Johnson, Great Britain's Health Secretary. He was quoted May 4 in Britain's Telegraph. All flu outbreaks tend to be worse in cold weather, and so far this H1N1 swine flu hasn't really seen any cold weather. In the Northern Hemisphere flu season is November to March. But seasons are reversed in the Southern Hemisphere - the cool weather of autumn is starting up right now in South America, where flu season is May to September. Although there haven't been many cases of H1N1 swine flu in the Southern Hemisphere yet, we may see that change shortly. We may get a preview of what's in store for us come November. Why are flu outbreaks always worse during the colder months? I heard an explanation on NPR's Morning Edition on Friday (5/8/09) that was completely new to me. I had always heard that flu spreads in winter because we're all cooped up together indoors. Turns out, that's not it at all! Dr. Peter Palese of Mount Sinai School of Medicine and his colleagues have been studying the transmission of flu between guinea pigs, which can get infected with human flu viruses. Palese's results over the last couple of years indicate that spending more time together inside is not the causative factor. Palese says flu viruses are more stable [and last longer, presumably] in colder, drier conditions. 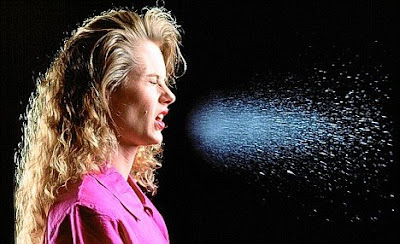 What's more, the droplets of fluid that people spray with sneezes and coughs are much smaller at lower temperatures and lower humidity, so the droplets carry much farther and stay suspended in the air longer. The smaller droplets can be inhaled more deeply into the respiratory passages and lungs, Palese says. The opposite is true at warmer temperatures and higher humidity, when the droplets become much bigger and sink to the floor, reports Palese. These influences are so pronounced that "at 75 to 80 degrees, we don't see any transmission." Wow! Who knew! But there's even more new data to debunk the old "crowded indoors" theory. Palese and his colleagues also report that colder, drier air makes mammals' respiratory tracts more vulnerable to infection by airborne viruses. 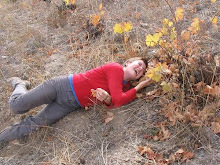 In cold air, "the mucous is much more viscous," Palese explains. Sticky mucus clogs up the cilia, or tiny hairs, that normally move in waves to expel virus-laden particles from the breathing passages. 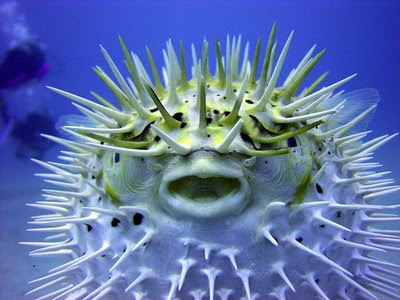 So in cold weather, inhaled flu viruses tend to stay where they land, reproducing and infecting the unfortunate victim. Well, it looks like this South American winter is going to be a testing ground for the H1N1 swine flu. We'll see whether it attacks with a real vengeance, spurring the next scary flu pandemic, or whether it fizzles out like some of its predecessors have done. For constantly updated info, see the H1N1 page on the website of the Pan American Health Organization. Richard Knox. May 8, 2009. Flu heads south for the winter. NPR Morning Edition. See this post featured on May 10 on BasilandSpice.com, an Official Google News Source. Two days ago I wrote a post about the connection between Smithfield and swine-flu, and about a call I received from a major European newspaper. 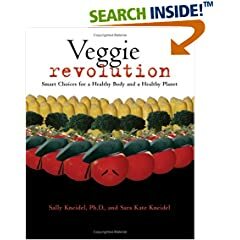 The reporter called me because I toured a Smithfield factory hog farm while researching our last two books, Veggie Revolution and Going Green. He wanted to know more about Smithfield's priorities and their methods, info that Smithfield would love to keep under the rug. Plenty of dirt has already been published on Smithfield's treatment of labor, animals, and the environment, in online documents such as Human Rights Watch's Blood, Sweat, and Fear. And in our own book, Going Green. But most people are still unaware of what the corporation is really about. Mexican newspapers are reporting that the current swine-flu outbreak came from a Smithfield operation in the Mexican town of Perote, Veracruz. (See my previous post.) In my last post, I speculated that the swine-flu virus might have been created from a blending of bird and swine genes in that Smithfield facility in Perote. I was wrong about that. Where did the virus (not the outbreak) originate? This morning, the Charlotte Observer reports these headlines "Swine flu has roots in N.C. outbreak." Is that surprising? No. NC is home to the world's largest hog-processing plant (a Smithfield plant) in the tiny town of Tar Heel, NC, on the banks of the aptly named Cape Fear River. Because wages are low and accident rates are high, most of the laborers in that facility are Latin-American immigrants, many undocumented. They slaughter, chop, and package 32,000 hogs in that one plant every day. Undocumented immigrants are the least likely worker population to complain about injuries or abusive working conditions, which is exactly why Smithfield chose the low-income, non-unionized immigrant workforce of Tar Heel for its biggest operation. Mexico is an even better site. Lower wages still, fewer regulations to impede Smithfield's plunder of labor, environment, animals. So...back to the origins of the H1N1 virus. No one is sure exactly where it originated, but "this virus was found in pigs here in the United States. They were getting sick in 1998. It became a swine virus," said Raul Rabadan, a Columbia University scientist studying the H1N1 gene sequence made public this week by the CDC. Continues the Charlotte Observer "it spread [in 1998] among pregnant sows in Newton Grove, about 45 minutes south of Raleigh (NC), causing them to abort their litters, and then to swine in Texas, Iowa and Minnesota." 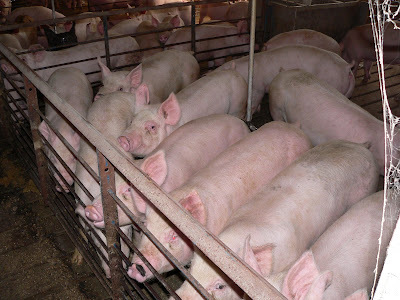 NC has 10 million hogs in factory farms, more hogs than the state has people. More hogs than any other state except Iowa. 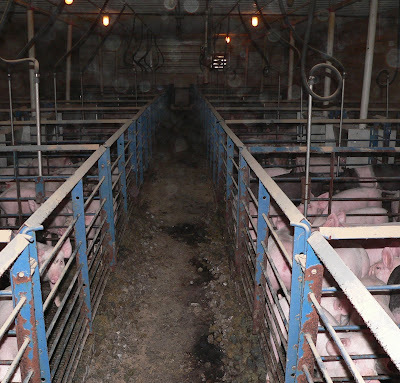 A single farm can have more than 50,000 hogs, all crammed together in filthy conditions. So it's not surprising that the virus may have made its first appearance 10 years ago in this state. By the way, 75% to 90% of NC's hogs are raised under contract to Smithfield and processed by Smithfield. The findings about the H1N1's origins have raised new concerns about the health impacts of factory farms (not to mention the environmental impacts, or labor concerns). The U.S. Humane Society targeted NC a couple of weeks ago, before the flu outbreak. 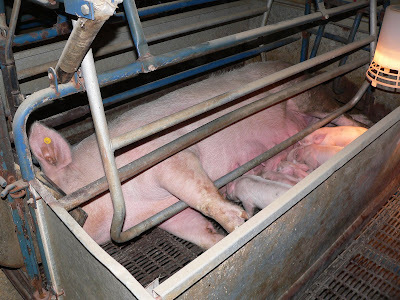 Because of the huge number of factory farms here, and animals packed so tightly in their own feces that they often can't even turn around, PETA has called on NC Governor Bev Perdue to close down all of NC's factory farms. Even the impartial PEW Charitable Trusts issued a report that said viruses can spread quickly among pigs in factory farms. As hog prices drop, we've been asked by the pork industry to avoid calling the virus the "swine flu," referring to it instead as the H1N1 virus. Said Jay Levine, an N.C. State University professor, the name "swine flu" is "a little bit of a misnomer." Even Obama, in his Weds night TV address, referred to it as H1N1. But, as it turns out, "swine flu" is not a misnomer. Reports this morning's Charlotte Observer, "The current strain's eight genetic segments are all associated with swine flu." That's according to Raul Rabadan, the Columbia scientist studying the H1N1 gene sequence. So what if it hurts pork prices? Well. It is swine flu, so why not call it that? If it causes pork prices to continue to fall, well maybe Smithfield will have to close down some of their facilities. And even if the virus did not first form in the Smithfield facility in Veracruz, Mexico, but instead in North Carolina, I'm guessing that Smithfield hogs were involved in its origins.